I’m participating in S268 aboard the SSV Robert C. Seamans as a visiting scientist; I like to refer to myself as ‘the tuna person.’ In my shore-based life, I am a graduate student in the MIT-WHOI Joint Program in Biological Oceanography, in the Fisheries Oceanography and Larval Fish Ecology lab under the supervision of Dr. Joel Llopiz. The lab focuses on early life history stages of fish, including anadromous fish such as alewives in the ponds and lakes of New England, Gulf of Maine groundfish such as cod and haddock, Caribbean reef fish, and highly migratory species such as tunas and billfishes. Personally, I am really interested in how growth, transport, and survival of larval fish influence the population productivity and the resultant fisheries management implications. Over the past year, I have grown increasingly interested in tunas, largely due to the recent publication of evidence of a previously unrecognized spawning ground for western Atlantic bluefin tuna (Richardson et al 2016). So, when the opportunity presented itself to spend 6 weeks at sea in the Equatorial Pacific studying larval tunas, I needed no convincing. 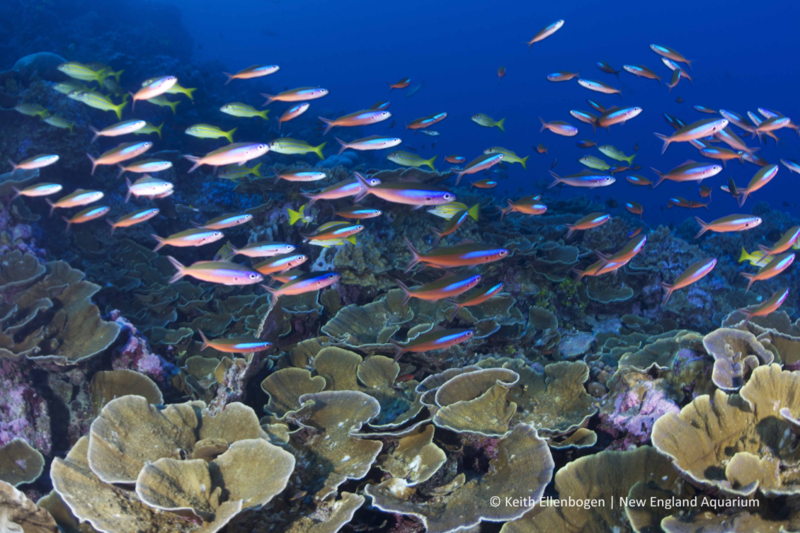 My participation in cruise S268 is supported by a grant from the Phoenix Islands Protected Area Trust. The Phoenix Islands Protected Area (PIPA), one of the largest marine protected areas in the world, comprises nearly 11% of the exclusive economic zone (EEZ) of the nation of Kiribati; Kiribati earns somewhere in the neighborhood of 70% of their GDP from the sale of tuna fishing licenses to foreign fleets. So, they have a very real interest in whether or not this massive no-take zone will protect and/or increase tuna populations. Highly migratory species, such as tunas, are difficult to manage because they can cross many international boundaries in one calendar year. Spawning area closures are therefore an attractive measure, but the magnitude of tuna spawning inside PIPA is unknown. Enter the Robert C. Seamans, a tallship with the ability to sample zooplankton in these remote waters. By studying the distribution of larval tunas, we can draw conclusions about spawning activities in the area. We use two types of nets to cover three depth regimes, allowing us to generate a fairly complete image of the zooplankton community in PIPA. The Tucker Trawl (image) has a 1 m2 rectangular opening; we perform two net tows with this net. 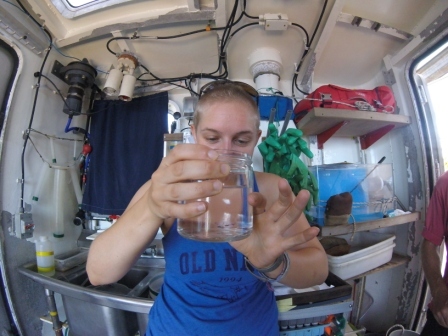 The first, the ‘deep’ tow, has a target depth of 130m, which allows us to sample the deep scattering layer of zooplankton that live around the thermocline. The deep scattering layer is dominated by an environmentally-mediated community of shelled organisms, including euphausiid, mysid, and decapod shrimps; amphipods; copepods; pteropods; and ostracods, which bioluminesce in beautiful blue! The second, the ‘shallow’ tow, has a target depth of 50m, which allows us to concentrate our sampling efforts in waters that are most likely to contain larval tuna, which prefer clear, oligotrophic subsurface waters. 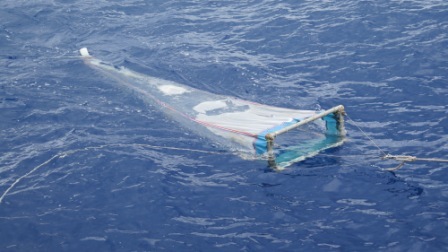 The third tow uses a Neuston net, which has a rectangular frame that is designed to ride the ocean surface, with half the frame above and half below the air-water interface. The animals that live closest to this interface tend to be distinct from other depth regimes. Many are darkly pigmented to protect them from UV exposure, like the royal blue copepods that often dominated the Neuston samples. 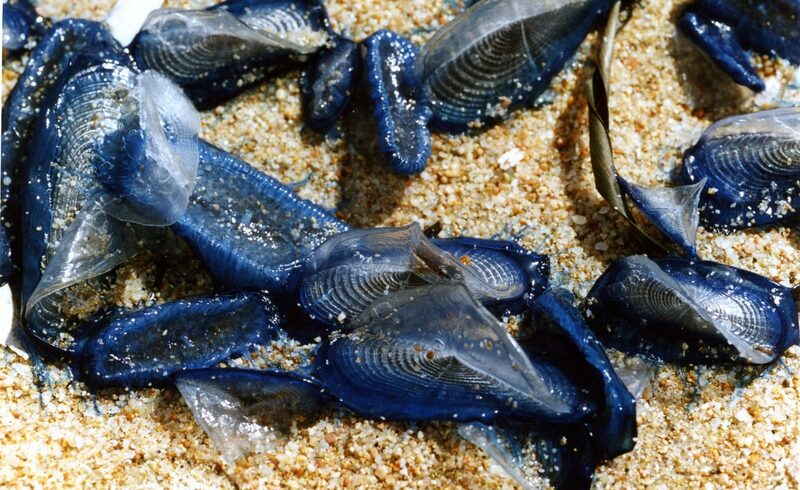 There are also creatures that live on the very surface, such as Halobates or ‘water striders’, an insect that uses long legs and the surface water tension to ‘walk on water’ and Velella velella or ‘by-the-wind sailors,’ gelatinous organisms with a thin blue body that rides horizontally on the water surface and a vertical ‘sail’ that causes them to drift according to wind direction rather than water currents.